Jewish Humor Central: Throwback Thursday Comedy Special: Sid Caesar in "The Fur Coat"
Throwback Thursday Comedy Special: Sid Caesar in "The Fur Coat"
When Your Show of Shows was canceled in 1954, Sid Caesar started a new show called Caesar's Hour. 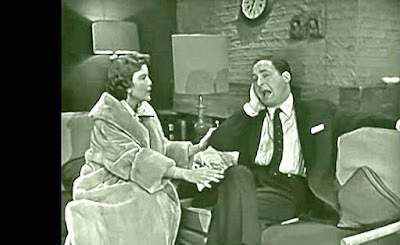 The popular series of sketches called The Hickenloopers, about a bickering married couple, was recast as The Commuters, with Nanette Fabray playing Sid's wife as Imogene Coca had played in The Hickenloopers. In this 1956 episode of The Commuters, "The Fur Coat," Nanette finds a real bargain in a beautiful beaver fur coat and can't resist buying it. Sid's reaction and the confrontation about money give us a hilarious 17 minute episode. Sid's sidekicks Carl Reiner and Howard Morris are also in the sketch. A Joke to Start the Week - "The Right Password"